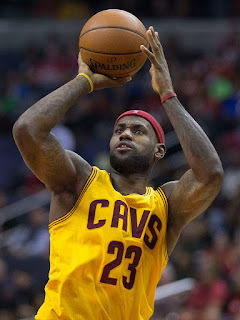 LeBron James wore the number 23 when he first played with the Cleveland Cavaliers but he switched to a different number in 2010-11 when he joined the Miami Heat and then switched back to 23 when he rejoined the Cavaliers in 2015. After switching numbers the first time, LeBron publicly stated he thought no NBA players should wear the number 23 anymore out of respect for Michael Jordan. But plenty of other great players have also worn the number 23 for at least parts of their NBA careers. Here is a list of the best NBA players who wore the number 23 during their NBA careers. Almost everyone knows that number 23 was Michael Jordan's main number, but did you know that MJ played in the NBA with two other numbers? If you can name those two other numbers, you know your NBA trivia. To see those numbers read What Other Two Numbers Besides 23 Did Michael Jordan Wear in the NBA? Everybody associates the number 23 with Michael Jordan, but did you know that Michael Jordan also wore two other numbers during his NBA career? Can you name those two numbers? LeBron James wore number 23 out of respect for Michael Jordan,while he was with the Cleveland Cavaliers from from 2004 to 2010. When LeBron went to play for the Miami Heat, he switched to the number 6 because it was Julius Erving's number. Doctor J is LeBron's second all-time favorite NBA player. Also, LeBron's son, LeBron Jr., was born on October 6, 2004, and his second son was born in June the 6th month of the year. LeBron switched back to number 23 when he went back to the Cavs for the 2015 season. Super John Williamson wore the number 23 for his entire professional basketball career. Williamson played three years in the ABA, where he averaged 14.1 points per game. He then played five years in the NBA, and averaged 22.8 points per game. Super John played 135 games for the New Jersey now Brooklyn Nets from 1978 to 1980, and averaged 23.1 points per game. I remember as a kid watching him and Bernard King run the fast break to perfection, giving us Nets fans great thrills. Williamson and King were just two great NBA scorers. Super John Williamson passed away from diabetes complications in 1996 at the age of 44. Current NBA star Anthony Davis of the New Orleans Pelicans wears number 23. Davis is leading the NBA in scoring in the 2016-17 season. Alex English wore the number two for most of his playing career, but he wore the number 23 in 1977 with the Milwaukee Bucks. English averaged 21.5 points per game during his career, and won a scoring title in 1983 with the Denver Nuggets. His number two is retired by the Nuggets. Alex English was inducted into the Basketball Hall of Fame in 1997. Mitch Richmond wore the number 23 during his first three NBA seasons while with the Golden State Warriors from 1989 to 1991, and also during his last season with the Los Angeles Lakers in 2002. In between, Richmond wore the number 2 with the Sacramento Kings and Washington Wizards. For his career, Mitch Richmond averaged 21.0 points per game, and scored 20,497 points in the NBA. Lou Hudson wore the number 23 for his entire NBA career from 1967 to 1979. Hudson averaged 20.2 points per game in his career, and four times he averaged over 25.0 points per game for a season. Mark Aguirre switched to the number 23 after the Detroit Pistons traded Adrian Dantley for him in 1989. Aguirre wore 23 with the Pistons from 1989 to 1993. He also wore the number 24 with the Dallas Mavericks from 1982 to 1989, and the number seven with the Los Angeles Clippers during his last season in 1994. For his career, Aguirre averaged 20.0 points per game, and scored 18,458 total points. Retired NBA greats who wore number 23 include two Basketball Hall of Fame players, Calvin Murphy and Frank Ramsey. Current NBA players besides LeBron James and Anthony Davis who wear number 23 include Allen Crabbe, Deyonta Davis, Draymond Green, John Jenkins, Wesley Matthews, Ben McLemore, Jusuf Nurkic, Fred VanVleet and C.J. Wilcox. Interestingly, LeBron James current teammate J.R. Smith wore the number 23 during his first two seasons in the NBA in 2005 and 2006. J.R. now wears the number 5. Trivia Answer - Joe Jellybean Bryant, the father of Kobe Bryant, wore number 23 for seven of his eight years in the NBA. I adore these guys, they are world legends in basketball. If you are a beginner basketball player, I advise starting to train your feet http://verticaljumpprograms.net/lebron-james-jersey/. My son has received several medals and an invitation to the youth national team through constant training and a strong desire. kids croquet set Sports tapes are mainly used to prevent additional damage to current injuries by minimizing muscle movement. They are particularly used on the feet, hands, wrists and fingers which are the most vulnerable areas for athletes.